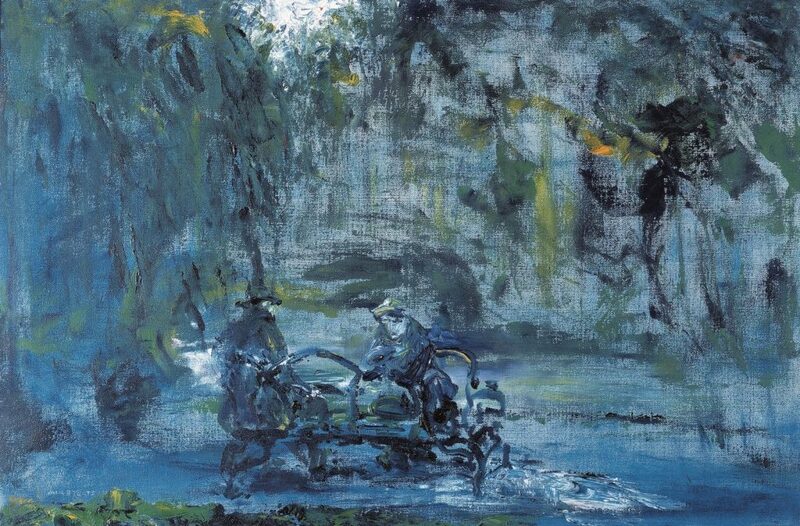 This painting was created towards the end of Yeats’s career when his style had become very loose and dynamic. The painting depicts two figures sitting on a bench in St. Stephen’s Green at twilight. One appears to be sitting on the arm of the bench while the other squats beside them. The eminent closure of the park indicated by the title contrasted with the demeanour of the seated figures to create a sense of tension and expectancy within the work. Paint is applied in fast, broad brushstrokes directly to the canvas using a dry brush technique which leaves the surface and texture of the canvas visible to form the background of the painting through the painted foliage. Small amounts of thick white impasto paint indicate a source of light above the figures and create a diagonal of light which draws the viewer’s eye to the centre of painting, to the figures and upwards to the source of the light. The elegiac note in the painting, suggested by the fading daylight and the departing figures, is enlightened by tiny passages of colourful grass and flowers.